Beach Haven in Sheringham, Norfolk sleeps 6 people. Beach Haven in Sheringham has wonderful views and excellent walking, with the coastal path direct from door; Beach Haven offers the warmest of welcomes at any time of the year. Relax and enjoy the wonderful views of the enclosed garden, and beyond, from the full length windows in the living room. 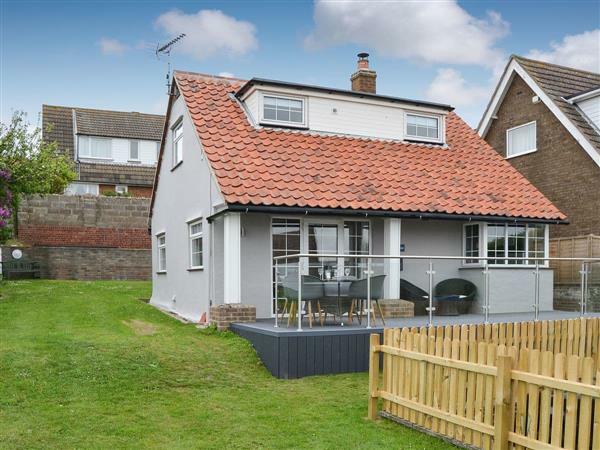 This refurbished, detached house is tucked into the hillside, on one of North Norfolk’s highest landmarks, Beeston Bump is a Site of Special Scientific Interest, and the entrance to the coastal path is just 5 yards from here. It is a 15-minute walk down to the town and beach of the popular seaside town of Sheringham. Leave the car behind and enjoy the wide range of amenities for both young and old alike on the doorstep. The town centre offers shops, cafés, pubs and is host to regular market days. Attractions include Sheringham Park, Splash Leisure and Fitness Centre, tennis courts, golf course, pitch and putt and the beach. Enjoy a day trip on the Poppy Line North Norfolk Steam Railway, running along the coast to Weybourne and historical market town of Holt. Bird watchers, walkers and those wishing to explore the coastline will be delighted. The Georgian market town of Holt is 8 miles and Blakeney Quay and Salt Marsh RSPB nature and bird reserves is 9 miles. Take a boat trip to visit the basking seal colonies and the National Trust’s Blakeney Point Reserve. The neighbouring seaside town of Cromer is 4 miles away, with a beach, promenade, pier, shops, pubs and cafés. Norwich city centre is 27 miles for excellent shopping, castle, museum, theatre, market square, cafés and restaurants and Wroxham is 25 miles, with shops, waterside restaurants, cafés, and daily boat hire and river trips are available to explore the miles of inland waterways rich with bird and wildlife. The National Trust’s Felbrigg and Blicking Halls are a short drive away and Holkham Hall, beach and the Royal Sandringham House and Gardens are an hour’s drive. The beach is ¼ mile from Beach Haven in Sheringham. With the shop, pub and restaurant ½ mile from Beach Haven. Living room: With wood burner, Freeview TV and beams. Gas central heating, electricity, bed linen, towels and Wi-Fi included. Initial logs for wood burner included. Enclosed lawned garden with patio and garden furniture. Private parking for 2 cars. No smoking. Please note: There are 3 steps in the garden. Holidays at Beach Haven run from Friday to Friday. Pets allowed at Beach Haven. For a better idea of where Beach Haven is, you can see Beach Haven on the map below. Beach Haven is in Norfolk; should you be on the lookout for a special offer, you can find all the special offers in Norfolk. It's always worth checking to see what is on offer at the moment. Do you want to holiday near Beach Haven (UKC3203), you can see other cottages within 25 miles of Beach Haven; have a look to find your perfect holiday location.